The nuclear Damocles sword of the cold war was lifted in 1990. Not in a cataclysmic end, but almost peacefully by the dislocation of the whole Soviet block. This had tremendous consequences however for the Pentagon policies (and the military-industrial complex), as there was no more incentive under the eyes of the Senate and general public to maintain a huge defense budget. A good indication for that is the fate of US Modern tanks: Like the M1 Abrams. The iconic main battle tank is dating back from 1978, that’s almost 40 years from now !. No real replacement program has ever taken place. The old trusted “battle taxi”, the M113, was also silently but surely out of register, also without a real replacement in view; Ground Forces nowadays relies -also dictated by the experience of the longest war faced by the United States since Vietnam- by wheeled vehicles: The Stryker family, the Hummer, and numerous MRAPs/MPVs which reflects the need for vehicles adapted to the urban environment and asymmetric warfare. 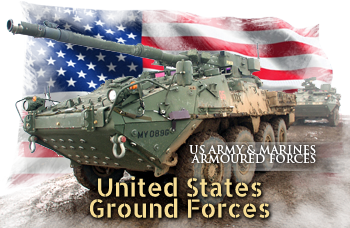 Just like Russia and the successor states were left with tens of thousands of obsolete and worn-out tanks and limited budgets, the US Army/Marine ground assets were to be seriously reduced in a concerted manner. The M1A1/A2 Abrams and variants were kept in service while older M1s joined the national guard and replace the former M60 and M48 still in the inventory. This process was achieved in the early 2000s and the concept of this reduction can be further expanded to other AFVs. The old organizational structure was to be modified. The traditional composition was a regular army alongside National Guard and the Army Reserve. By the 1986 Goldwater–Nichols Act, the command structure was simplified, under a simple pyramid from the President to the unified combatant commanders in their own geographic/function area of responsibility to have all possible military assets underhand. In 2013 the regional command structure was also modified, with the Central headquarter at Shaw Air Force Base, South Carolina, North and south HQs at Fort Sam Houston, Texas, Europe HQ at Clay Kaserne, Wiesbaden, Germany, Pacific HQ at Fort Shafter, Hawaii and Africa HQ at Vicenza, Italy. Base units were displaced from divisions to brigades, and compositions changed: As of 2014, the Armor brigade, were 4,743 troops strong, the Stryker brigades, 4,500 and the Infantry brigade 4,413. The Stryker brigades were high mobility armored brigades also known as the Stryker brigade combat team or motorized brigades equipped with the 8×8 vehicle which formed its backbone. Equipped with General Dynamics LAV IIIs they are air-transportable worldwide within 48h. 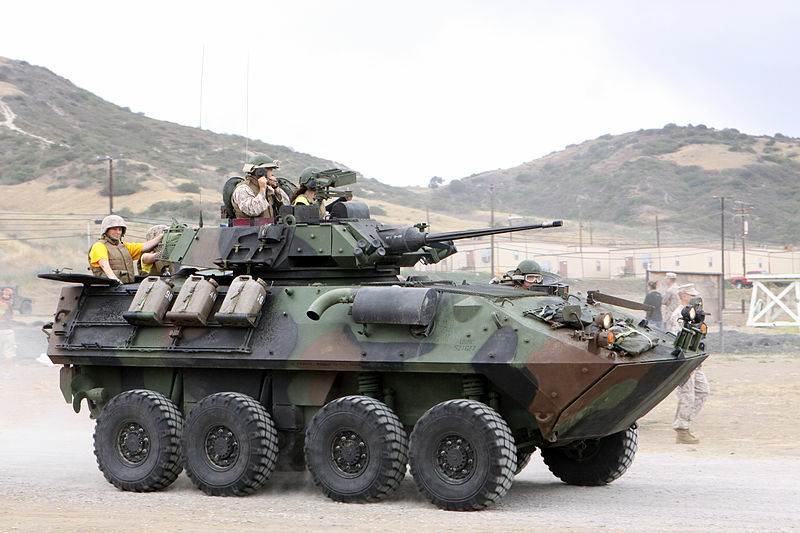 The LAV-25 Stryker family was derived from the Swiss Mowag Piranha, through a Canadian license-produced vehicle. It has been delivered by the thousands since the 1980s to the USMC and US Army alike and replaced since by the Pirhana-III derived LAV-III or Stryker M1120. The modern “battlehorse” of the of the US Army and Marines is the High Mobility Multipurpose Wheeled Vehicle (HMMWV) or “Humvee”, which proved its extreme versatility and partly replaced the M113. The iron fist of the Army is the M1A2 Abrams main battle tank, well completed by the while the M2A3 and M3 Bradleys as standard infantry fighting vehicles and recce variant. M1120 Stryker The standard wheeled APC/IFV of the US Army today (2000). Derived from the Canadian LAV-III, 4,187 are in service today, in many variants, including the 105mm M1128 Mobile Gun System. Third, the Stryker, and the M113 armored personnel carrier, made the bulk of the APC force, well completed today by a large fleet (25,000 since 2007 until today) of Mine Resistant Ambush Protected (MRAP) vehicles form various manufacturers. There were purchased for the current tasks in line, with no long-term plans. Following the retirement of Afghanistan and Iraq, about 7,456 are now retired and stored while 8,585 are kept active. But future prospects indicates that on this total 5,036 are to be put in storage, while the remainder (1,073) are to be kept for training only and the active force. The most current of these MRAPs is the Oshkosh M-ATV (5,681 vehicles estimated to be kept), a good compromise between the ill-adapted Humvee and 20-tons class heavy 6×6 MRAPS like the Cougar and Buffalo. The Navistar MaxxPro Dash fleet counts 2,633 vehicles. Cougar, BAE Caiman, and heavy duty MaxxPros are pending retirement and storage. The U.S. Army artillery force counts on two veterans, the M109A6 Paladin self-propelled howitzer and the M270 Multiple Launch Rocket System (MLRS) for heavy mechanized units. Not US modern tanks, but complementary is the covering umbrella of the Army’s rotary-wing aircraft fleet. Its rock star is the AH-64 Apache attack helicopter, complemented by lighter OH-58D Kiowa Warrior (recce/light attack), UH-60 Black Hawk (utility/transport), CH-47 Chinook heavy-lift transport. Reduction plans call for 750 of these to be kept active. For air transportation, the Air Force brings its support with the C5 Galaxy, Hercules and C-17 Globemaster. The Marines relied mostly on variants of the Huey Cobra, comprehensively upgraded. HEMTT carriers Probably the most common vehicles in service, making the bulk of the logistics assets, are some 13,000 trucks, declined into a large variety of variants on 8×8 and 10×10 chassis. Logistics depends entirely on the Heavy Expanded Mobility Tactical Truck (HEMTT). Dozens of types are available and armored ones were introduced during the occupation of Iraq and in Afghanistan. These extremely versatile, standardized 8×8 all-terrain vehicles produced by a unique manufacturer of military specs: Oshkosh Truck Corporation. AM General, MAN, and Pacific Car & Foundry (PACCAR) also submitted designs but were not retained. Over 27,000+ newly build and remanufactured are in service today. Of course the Marine Infantry of old, simply known as the “Marines” was a specialist of naval amphibious operations and took on its shoulders the brunt of the Pacific war, forging a legend. But more recently the USMC accustomed the press to the concept of “marines in the desert”, in Iraq and Afghanistan, using the same array of AFVs the Army used, and throughout the years 2003-2014 took their tour of duty in patrol, police, and training operations in an environment and with missions far away from amphibious ops. Semper Fi? Budget cuts and reforms due to the end of the cold war spared a bit it seems the USMC. It represents today 6% of the global defense spending. Seen as a versatile and somewhat “cheaper” corps (less the support ships), it was the first also to present in 2013 a fully audited annual budget. Main bases are Camp Pendleton on the west coast and Camp Lejeune on the east coast. There is also a permanent base in the Pacific, at Camp Butler in Okinawa. These are major bases related to the expeditionary forces but there are also 11 bases spread in mainland USA for reserves. But perhaps the “brain” of the whole edifice is the Marine Corps Base Quantico in Virginia were most of the top training, research and development took place. M601 ERA of the USMC at the battle of Kuwait Airport, February 1991. Military assets supporting or in close coordination are diverse: The US Navy of course, through the largest amphibious force worldwide, strong of 6 large LHDs capable to deliver at sea entire brigade with a full air support of jets (AV-8 harrier II) and all sorts of helicopters, of which the replacement for the Apache is the Marines Super Cobra and Viper attack models. Some of these naval assets are fully amphibious like the LCAC (Landing Craft Air Cushion) series, which can penetrate well inshore contrary to the old landing crafts. The USAF can also airlift Marines through the Air Mobility Command, but there is a dedicated structure, the Marine Air-Ground Task Force. The latter is made today of seven MEU (Marine Expeditionary Units) organic to the USMC. Each of these could be called to perform spec ops. AAV-7 (LVTP-7) off the USS Bonhomme Richard well deck. These vehicles came from a long tradition developed from the pacific war. There are specialized and “standard” Army vehicles borrowed from the Army, but in many cases in the past, vehicles had often distinct characteristics. This goes back to the Pacific war when outside the proper fleet of LVTs, M4 Sherman tanks for example retained by the USMC were always diesel-powered. Tank warfare of course during ww2 in the Pacific was reduced to the nature of the terrain and scarcity of Japanese tanks. The Marines made also use intensively of specialized variants like flamethrower tanks. AAV-7 (LVTP-7). This amphibious APC of 1972 was produced to an extent of at least 1,690 vehicles. During the cold war, in particular in Vietnam, the Marines played a considerable rôle and used a large variety of AFVs, including the LVTP-5 for coastal operations but also US Army vehicles like the M48 Patton and M113 APC. Nowadays, the AAV-7 or Amphibious Assault Vehicle-7 (former LVTP-7) is the main amphibious APC of the USMC, with over 1,300 in service, including specialized C&C and recovery variants. In the 1990 gulf war, it deployed actively M60A1 and M1A1 Abrams. The former were retired afterward, but 403 Abrams are still operated today, supported by 69 M88 ARVs. However, the most current vehicles used are wheeled: Some 19,598 Humvees of the main A2 and upgraded ECV types and many sub-variants, and OshKosh 6×6 MTVR trucks (1998) which are armored and versatile, well used for convoys in Iraq and Afghanistan (about 11,000 total for the Army and Marines). The most important vehicle in recent times for the USMC perhaps has been the 8×8 LAV-25 APC/IFV (8 variants, 778 in service). Mobile “Artillery” support came with the HIMARS High Mobility Artillery Rocket System. In Iraq and in Afghanistan the Marines also made extensive use of all MRAPs in service with the Army, without notable differences. M1A2/SEP Abrams An overkill in modern conflicts, the iconic US main battle tank only exists in its latest version, previous M1 (2,385), M1A1 (4,393), M1A2 being deactivated and stored. Whereas 1,174 M1A2/M1A2 SEP would be in active service. The M1128 Mobile Gun System is the latest Stryker-based vehicle in use with the US military. The main armament consists of a remotely operated autoloading 105-mm main gun. The Assualt Breacher Vehicle (ABV). Entering service in 2008, around 240 of these M1-based Combat Engineering Vehicles (CEVs) have been produced. They are equipped with two Line-Charge Launchers and can carry a mine-clearing plow or a versatile dozer blade. MRAPs:Available in 4×4 and 6×6, these 15 tons MRAPs were produced from 2002 by Force Protection Industries to 1,317 vehicles. Caiman: 2868 of these heavy MRAPs were produced by BAE Systems (2007). International MaxxPro: Over 9,000 manufactured MRAPs by International Truck/Plasan but 5,214 kept in service. Existed in 13 – 14 ton variants. And the heaviest of them all, the mighty Buffalo (20 tons) (illustration) which in reality is an MPV plus mine disposable vehicle. M2 Bradley This IFV made the staple of US Armoured divisions today: 6230 in active service, more than any other tracked AFV. M3 Bradley The specialized recce version: 500 in service so far. Humvee The most current American APC to date: It was intended to replace the Jeep. Indeed, 280,000 were cranked up since the early 1980s, a record, but still less than the original (650,000). Nevertheless, the HMMV have a wealth of flexibility like no other US Army vehicle so far: 27 major variants and many more sub-variants. In total, around 240 to 260,000 are in service today, but many will be soon available on the market (military export, then civilian) as it is scheduled for replacement by the Oshkosh L-ATV. Light Strike Vehicle An interesting half-dragster half-dune buggy concept developed during the gulf war for special ops, it is completely unarmoured and reduced to a motorized frame in order to be lightweight, and fast indeed: 130 overall and 110 kph off-road. Basically, this vehicle trades speed for protection. Numbers unknown. M109 Paladin The famous cold war self-propelled howitzer is the mainstay of the motorized artillery support. So far, perhaps 4,000 has been delivered so far, chiefly exported. Only 950 remained in US service. MLRS M270 The standard 1980s-1990s NATO Multiple Rocket Launcher, capable to deliver a large variety of vectors, from 20 km range rockets to 120 km range missiles, thanks to a modular launcher. Over 1,300 manufactured so far, still 930 in service with the US Army. In addition, about 340 M142 long range tactical missile launching systems are based on the standard Army Medium Tactical Vehicle (MTV) truck. M1117 ASV The standard recce and multipurpose 4×4 armoured car which recalls the Vietnam-era CGC M706, but in reality well-modernized (1999) by Textron Marine & Land Systems vehicles and also influenced by the European VAB. 2,777 are in service today. Oshkosh L-ATV By all means the actual -partial- designated successor of the legendary Hummer, if the result of the US military’s Joint Light Tactical Vehicle (JLTV) contract is confirmed as of today. This vehicle was tailored for asymmetric warfare and is much better protected than the Humvee but also much faster than usual MRAPs. 16,900 are in service today but 50,000 and more are planned for the next twenty years. Oshkosh M-ATV The heavier version (2009), with an emphasis put on mine-blast protection (MRAP). 5,500 are currently in service. RG vehicles Purchased in South Africa, due to its early experience with mine and ambush protected vehicles. The RG-31 Nyala is derived from the Mamba APC (1995), and 595 were pressed into service with the US Army (1,400 with the USMC). Well proven in combat in Iraq already. The much heavier RG-33 (2006) is based on the former, but lengthened. 1,167 in service with the US Army and USMC. SPAAML Three types of SPAAMLs are maintained in service today with the US Army: The Avenger missile system, based on the Hummer (short range) about 800 in service, the MIM-104 truck with the long range Patriot (about 1,100 in service), while the only SPAAG retained is the truck trailer-based C-RAM, carrying the impressive Phalanx system, able to destroy missiles at short range. Comparable to this one, not sure, i suppose you’ll have to google it. the humvees are being replaced by a new more effective armoured car. its called the marauder. it has thicker Cobham than the Abrams and can withstand more of a beating. it looks pretty cool. None of that is remotely accurate, the Humvee is being replaced by the Oshkosh JLTV. Do you have a page for the Bradley IFV ? If you mean 2017, you are correct in saying that the M1A3 will be put into production. As for it’s armament, the Army has yet to decide. Rheinmettal has been experimenting with 130 and 140mm cannons, so it is possible that one of the two if not both will be used on Abrams or Leopard series of vehicles. Is the US planing on replacing the paladin with some other type of SPG? Regarding the entry for the L-ATV “16,900 are in service today but 50,000 and more are planned for the next twenty years.” this is incorrect. As of April 2017 the program is still in LRIP and only about 30-40 have been delivered out of about 1,500 ordered. Full production won’t begin until 2019 with a Full IOC of 2020. The expected number to be ordered for the US Army alone will be about 50,000, but that is uncertain yet. I would like to see a page on the Stryker IVF. Us too ! It’s on the tube. Illustrations are already done. Why don’t any of these tanks have a repeating cannon / banana clip cannon ?? The Marines need to look at bringing the EFV or reconfiguring the ACV 1 with tracks for better off road performance and a 25 or 30mm cannon to support the Marine rifleman. Over all, I love this site. However a bit let down, its as if they are trying to have an ‘all in one’ page for the MBT, AFV, IFV, etc. The Abrams is a brief paragraph, and none of the specs (did I miss something? Hello Jack, there’s a full article on the M1 Abrams on the website! However, it is in the Cold War section! Links for vehicles that are still in use but were built in the Cold War need links posted in the modern section, too. Examples: M1, M2, M270, M109.